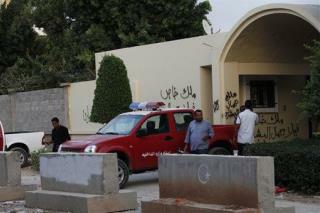 (Newser) – US officials didn't see the attack on their Benghazi consulate coming—but critics say they should have. There was a slew of terrorist activity in the months before, including a June 6 IED attack on the consulate itself, the Wall Street Journal reports, but Ambassador Chris Stevens kept security to a minimum to show trust in Libya's new government. State Department officials say they were mainly worried about RPG and IED attacks. Given that the June attack harmed no one, one official said, "Our security plan worked." Next on Newser: Most-Watched Convention Speaker Was ... Joe Biden?! Fellow Americans, we need to clean house (especially the White House) in Nov. or more Americans will die! Hmmm, I'd hate to see how things would have turned out if our security plan hadn't worked. us official is 100% right the security plan worked very well for the bad guys. nice job us guys better luck next time! rip sad very sad!